CONTEXT: Chronic obstructive pulmonary disease (COPD) is a heterogeneous disorder, and various aspects of COPD may be associated with the severity of pneumonia in such patients. AIMS: We examined the risk factors associated with severe pneumonia in a COPD population. MATERIALS AND METHODS: We performed a retrospective observational study using a prospectively collected database of pneumonia patients who were admitted to our hospital through emergency department between 2008 and 2012. Patients with hospital-acquired pneumonia and those with an immunocompromised status were excluded. RESULTS: Of 148 pneumonia patients with COPD for whom chest computed tomography (CT) scans were available, 106 (71.6%) and 42 (28.4%) were classified as non-severe and severe pneumonia, respectively. Multivariate logistic regression analysis revealed that the severity of airflow limitation [odds ratio (OR), 2.751; 95% confidence interval (CI), 1.074-7.050; P = 0.035] and the presence of emphysema on a chest CT scan (OR, 3.366; 95% CI, 1.104-10.265; P = 0.033) were independently associated with severe pneumonia in patients with COPD. CONCLUSIONS: The severity of COPD including the airflow limitation grade and the presence of pulmonary emphysema were independently associated with the development of severe pneumonia. As COPD is a heterogeneous disorder,  various aspects thereof, including radiological findings, the severity of airflow limitation, the presence of comorbid conditions, and the presence of organisms potentially causing pneumonia, may be associated with the severity of pneumonia in such patients. However, few data are available on the impact of the various possible factors on the development of severe pneumonia in COPD populations. Therefore, we sought to identify risk factors associated with severe pneumonia in a COPD population. We evaluated demographic characteristics, COPD-related variables, and chest computed tomography (CT) findings in COPD patients hospitalized with community-acquired pneumonia. This retrospective observational study used a prospectively collected database on community-acquired pneumonia and was conducted at the Samsung Medical Center (a 1,961-bed, university-affiliated, tertiary referral hospital in Seoul, South Korea) between January 2008 and December 2012. Some clinical data on the patients enrolled between 2008 and 2010 have been included in three articles published in 2010, 2013, and 2014. ,, The Institutional Review Board of the Samsung Medical Center approved the review and publication of information obtained from the database. The need for informed consent was waived because of the retrospective nature of the study. All consecutive patients with pneumonia admitted to our hospital through our emergency department were registered prospectively during the study period. A total of 2,670 cases of pneumonia were recorded, but we excluded 1,172 of these for the following reasons: 1) 779 cases had hospital-acquired pneumonia that developed after hospitalization for >72 hours or within 10 days of leaving the hospital, or who were transferred from another hospital after prior hospitalization for at least 48 hours;  and 2) 393 cases were immunocompromised patients. Thus, 1,498 cases of pneumonia were included in the present study initially, among whom 216 had both pneumonia and COPD (confirmed by spirometry performed either prior to admission or after recovery from pneumonia). If a patient was admitted more than once for pneumonia during the study period, data from only the first admission were analyzed. 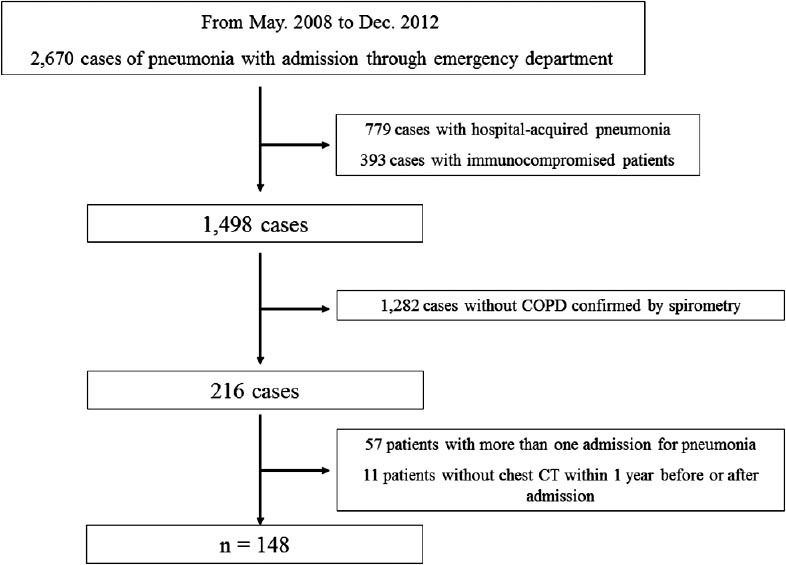 Penultimately, we included data from 159 COPD patients with pneumonia. Eleven further patients were excluded, because chest CT scans had not been performed within 1 year before or after pneumonia. Thus, a final total of 148 patients were included in the present study [Figure 1]. We diagnosed COPD via post-bronchodilator spirometry as recommended by the Global Initiative for Chronic Obstructive Lung Disease (GOLD). 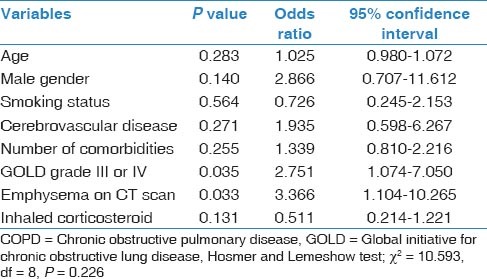 COPD severity was based on the GOLD criteria: GOLD grade I was defined as a forced expiratory volume in 1 second (FEV1) >80% predicted; GOLD grade II as an FEV1 of 50-80% predicted; GOLD grade III as an FEV1 of 30-50% predicted; and GOLD grade IV as an FEV1 <30% predicted. Inhaled corticosteroids, long-acting beta-agonists, anticholinergics, and theophylline used for at least 30 days prior to the diagnosis of pneumonia were considered to be previous COPD medications. All data are presented as medians (with interquartile ranges [IQRs]) for continuous variables or as numbers (with percentages) for categorical variables. The Mann-Whitney U-test was used to compare continuous variables, and Pearson's chi-squared or Fisher's exact test was used to compare categorical variables. Multivariate logistic regression analysis was performed after adjustment for age, gender, smoking status, and factors associated with P value <0.25 upon univariate analysis, including variables found to be of interest in previous studies (particularly a previous use of inhaled corticosteroids [ICS] ,, ). PSI and CURB-65 scores were excluded from the multivariate logistic regression model, because some variables used to calculate these scores had been entered already. Model goodness-of-fit was evaluated using the test of Hosmer and Lemeshow. A P value <0.05 was considered significant. All statistical analyses were performed using statistical package of social sciences (SPSS) version 20.0 (SPSS Inc., Chicago, IL, USA). 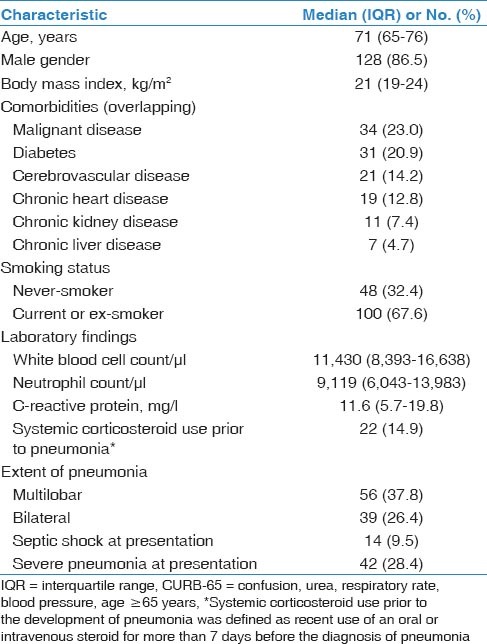 The baseline characteristics of the 148 patients with both COPD and pneumonia are shown in [Table 1]. The median patient age was 71 years (IQR, 65-76 years), and 86.5% were males. The most common comorbidity was malignant disease (23.0%), followed by diabetes (20.9%) and cerebrovascular disease (14.2%). Fourteen patients (9.5%) had septic shock and 42 (28.4%) severe pneumonia at presentation. The median PSI and CURB-65 scores were 97 (IQR, 76-121) and 1 (IQR, 1-2), respectively. 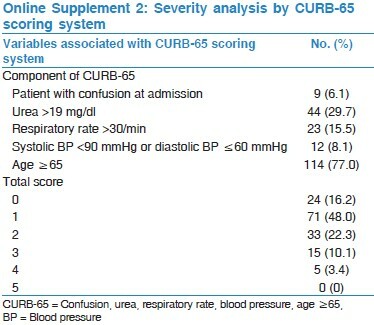 The PSI and CURB-65 scores are shown in Online Supplements 1 and 2. Eighteen patients (12.2%) were admitted to the intensive care unit, and 11 (7.4%) required mechanical ventilation. The median durations of antibiotic therapy and length of hospital stay were 14 (IQR, 10-16 days) and 8 days (IQR, 6-14 days), respectively. The in-hospital mortality rate of the 148 patients with COPD and pneumonia was 7.4% (n = 11). Of the 148 patients, 106 (71.6%) and 42 (28.4%) were diagnosed with non-severe and severe pneumonia, respectively. Of the patients with both COPD and severe pneumonia, 14 (33.3%) presented with septic shock and 11 (26.2%) required mechanical ventilation. As shown in [Table 2], the median PSI and CURB-65 scores were significantly higher in patients with severe pneumonia than in those with non-severe pneumonia (134 [IQR, 104-156] vs. 90 [IQR, 74-107], P < 0.001 for PSI; and 2 [IQR, 1-3] vs. 1 [IQR, 1-1], P < 0.001 for CURB-65). There was a significant difference in previous history of cerebrovascular disease between COPD patients with non-severe and severe pneumonia (P = 0.035); however, other comorbidities were not different. In addition, distinct differences were evident in both the rates of admission to the intensive care unit and mortalities between those with non-severe and severe pneumonia (1.9% vs. 38.1%, P < 0.001 for admission to the intensive care unit; and 2.8% vs. 19.0%, P = 0.002 for mortality). 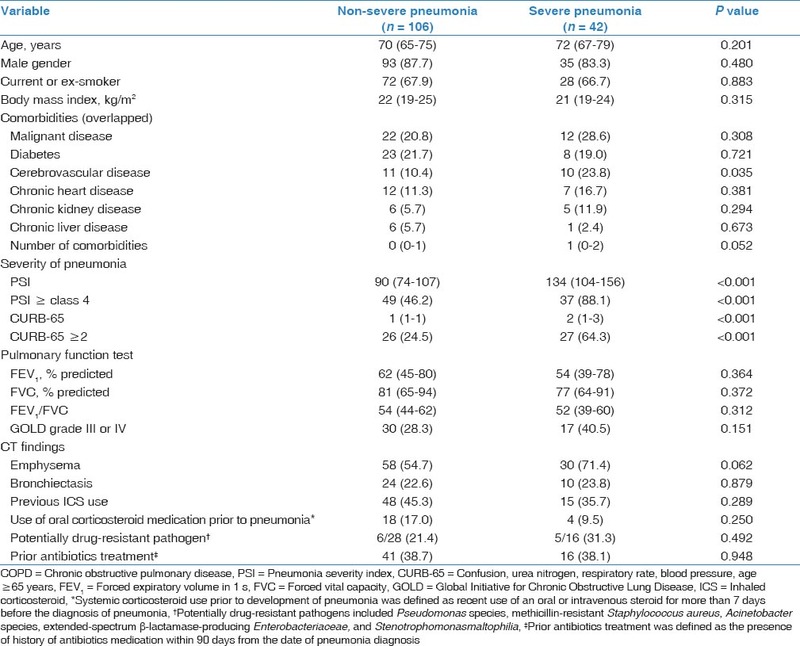 However, upon univariate analysis, no significant difference between patients with non-severe and severe pneumonia was evident with respect to age, gender, GOLD grade, the presence of emphysema or bronchiectasis, systemic corticosteroid use or ICS prior to pneumonia, and identified pathogens [Table 2] and [Table 3]. Multivariate logistic regression analysis was performed to identify the risk factors associated with severe pneumonia in the 148 patients with COPD [Table 4]. The severity of airflow limitation (OR, 2.751; 95% CI, 1.074-7.050; P = 0.035) and the presence of emphysema on a chest CT scan (OR, 3.366; 95% CI, 1.104-10.265; P = 0.033) were independently associated with severe pneumonia in COPD patients. 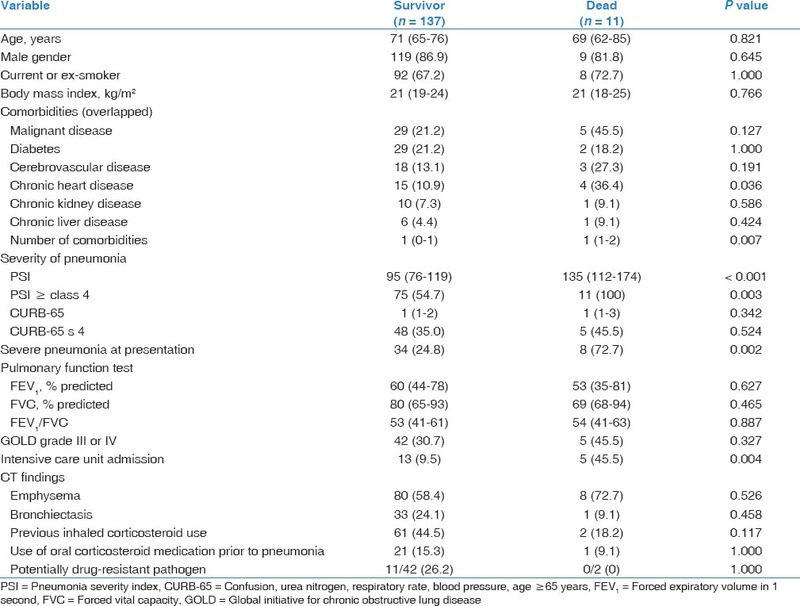 As shown in [Table 5], chronic heart disease, number of comorbidities, PSI, severe pneumonia at presentation, and intensive care unit (ICU) admission were related with mortality. However, the severity of airflow limitation and the presence of emphysema on a chest CT scan were not related with in-hospital mortality. The current study included 148 patients with radiographically confirmed pneumonia and COPD diagnosed via spirometry. We performed a wide-ranging evaluation of COPD- and pneumonia-related factors. A previous study showed that COPD patients presented with more severe pneumonia than did those without COPD. We extended this finding by showing that the severity of COPD including the airflow limitation grade and the presence of pulmonary emphysema, affected the severity of pneumonia in patients with COPD significantly. However, COPD severity did not associated with in-hospital mortality. Both emphysema and the severity of airflow limitation have significant impacts on COPD prognosis. Compared with COPD patients with minimal or no emphysema evident on chest CT scan, patients with emphysema were at an increased risk of a significant annual decline in FEV1, indicating rapid disease progression. , In addition, pulmonary emphysema evident on a chest CT scan has been shown as a strong independent predictor of mortality in COPD populations. ,, Emphysema on chest CT was also associated with poor prognoses of patients with both COPD and early-stage lung cancer. To the best of our knowledge, this is the first work to suggest a further impact of emphysema on the severity of pneumonia. Despite of lack of association with in-hospital mortality, COPD patients with emphysema were more critically ill at the time of hospital admission for pneumonia than those without emphysema. In contrast to what has been observed in pulmonary emphysema patients, bronchiectasis was not associated with severe pneumonia in COPD patients. We diagnosed bronchiectasis in 35 patients (23%), and 4-57.6% of COPD patients have been reported to have coexisting bronchiectasis. ,,,, It has been recognized recently that the presence of bronchiectasis is a predictor of poor prognosis in COPD population, which were thought to be attributed to colonization with or infection by a potentially pathogenic organism. , However, we found that bronchiectasis did not influence the severity of pneumonia, in agreement with the suggestion that a microbiological etiology, especially invasion by a potentially drug-resistant pathogen, may not have played a role in patients of our COPD population with particularly severe pneumonia. The current use of ICS has been suggested to be a potential risk factor for development of pneumonia in COPD populations.­ , However, effect of ICS on the severity of pneumonia still remains controversial. Chen et al., showed that prior use of ICS reduced the risk of short-term mortality and the need for mechanical ventilation after hospitalization for pneumonia. Whereas, an epidemiological study using a health insurance database reported that serious pneumonia (defined as hospitalization for or death from pneumonia) was related to the use of ICS, particularly high-dose fluticasone. In current study, we found no effect of ICS use on the development of severe pneumonia. Our study had several potential limitations. First, our analysis was retrospective in nature. Since the original study design did not seek to identify factors associated with severe pneumonia in COPD patients, COPD-associated factors were identified retrospectively from medical records. Thus, some COPD-associated factors including previous hospitalization or exacerbations were not limited to collect for analysis. Second, we evaluated only a relatively small number of patients treated at a single institution. A prospective study with a larger population is required to validate our results. In conclusion, we found that severe airflow limitation and pulmonary emphysema evident on a CT scan were associated independently with severe pneumonia in a COPD population. This suggests that patients with severe COPD and emphysema who present to emergency rooms with pneumonia require specific attention in clinical practice. We thank Duck Hyun Ryu, Ho Jung Jeong, and Jeong Hoon Kim (all from the Samsung Medical Center, Seoul, South Korea) for assistance in the data acquisition. Global Initiative for Chronic Obstructive Lung Disease (GOLD). Global strategy for the diagnosis, management and prevention of chronic obstructive pulmonary disease. (Updated 2014). Available from: http://www.goldcopd.org [Last cited on 2014 Jan 10]. Müllerova H, Chigbo C, Hagan GW, Woodhead MA, Miravitlles M, Davis KJ, et al. The natural history of community-acquired pneumonia in COPD patients: A population database analysis. Respir Med 2012;106:1124-33. Ryan M, Suaya JA, Chapman JD, Stason WB, Shepard DS, Thomas CP. Incidence and cost of pneumonia in older adults with COPD in the United States. PLoS One 2013;8:e75887. Liapikou A, Polverino E, Ewig S, Cillóniz C, Marcos MA, Mensa J, et al. Severity and outcomes of hospitalised community-acquired pneumonia in COPD patients. Eur Respir J 2012;39:855-61. Han MK, Agusti A, Calverley PM, Celli BR, Criner G, Curtis JL, et al. Chronic obstructive pulmonary disease phenotypes: The future of COPD. Am J Respir Crit Care Med 2010;182:598-604. Park HK, Song JU, Um SW, Koh WJ, Suh GY, Chung MP, et al. Clinical characteristics of health care-associated pneumonia in a Korean teaching hospital. Respir Med 2010;104:1729-35. Jeong BH, Koh WJ, Yoo H, Um SW, Suh GY, Chung MP, et al. Performances of prognostic scoring systems in patients with healthcare-associated pneumonia. Clin Infect Dis 2013;56:625-32. Jeong BH, Jeon EJ, Yoo H, Koh WJ, Suh GY, Chung MP, et al. Comparison of severe healthcare-associated pneumonia with severe community-acquired pneumonia. Lung 2014;192:313-20. Venditti M, Falcone M, Corrao S, Licata G, Serra P. Study Group of the Italian Society of Internal Medicine. Outcomes of patients hospitalized with community-acquired, health care-associated, and hospital-acquired pneumonia. Ann Intern Med 2009;150:19-26. Carratalà J, Fernández-Sabé N, Ortega L, Castellsagué X, Rosón B, Dorca J, et al. Outpatient care compared with hospitalization for community-acquired pneumonia: A randomized trial in low-risk patients. Ann Intern Med 2005;142:165-72. Ewig S, Ruiz M, Mensa J, Marcos MA, Martinez JA, Arancibia F, et al. Severe community-acquired pneumonia. Assessment of severity criteria. Am J Respir Crit Care Med 1998;158:1102-8. Fine MJ, Auble TE, Yealy DM, Hanusa BH, Weissfeld LA, Singer DE, et al. A prediction rule to identify low-risk patients with community-acquired pneumonia. N Engl J Med 1997;336:243-50. Lim WS, van der Eerden MM, Laing R, Boersma WG, Karalus N, Town GI, et al. Defining community acquired pneumonia severity on presentation to hospital: An international derivation and validation study. Thorax 2003;58:377-82. Shindo Y, Sato S, Maruyama E, Ohashi T, Ogawa M, Hashimoto N, et al. Health-care-associated pneumonia among hospitalized patients in a Japanese community hospital. Chest 2009;135:633-40. Kim SS, Seo JB, Lee HY, Nevrekar DV, Forssen AV, Crapo JD, et al. Chronic obstructive pulmonary disease: Lobe-based visual assessment of volumetric CT by Using standard images--comparison with quantitative CT and pulmonary function test in the COPDGene study. Radiology 2013;266:626-35. Matsuoka S, Yamashiro T, Washko GR, Kurihara Y, Nakajima Y, Hatabu H. Quantitative CT assessment of chronic obstructive pulmonary disease. Radiographics 2010;30:55-66. Calverley PM, Stockley RA, Seemungal TA, Hagan G, Willits LR, Riley JH, et al. Investigating New Standards for Prophylaxis in Reduction of Exacerbations (INSPIRE) Investigators. Reported pneumonia in patients with COPD: Findings from the INSPIRE study. Chest 2011;139:505-12. Chen D, Restrepo MI, Fine MJ, Pugh MJ, Anzueto A, Metersky ML, et al. Observational study of inhaled corticosteroids on outcomes for COPD patients with pneumonia. 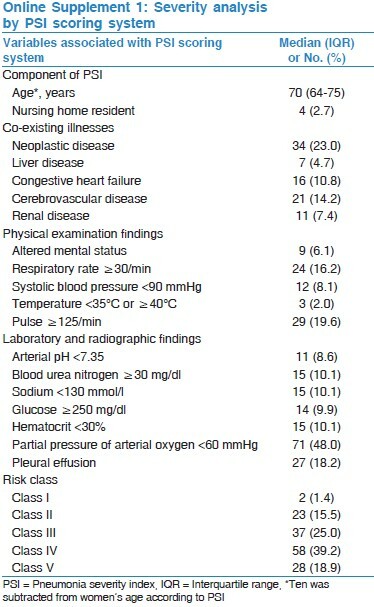 Am J Respir Crit Care Med 2011;184:312-6. Suissa S, Patenaude V, Lapi F, Ernst P. Inhaled corticosteroids in COPD and the risk of serious pneumonia. Thorax 2013;68: 1029-36. Vestbo J, Edwards LD, Scanlon PD, Yates JC, Agusti A, Bakke P, et al. ECLIPSE Investigators. Changes in forced expiratory volume in 1 second over time in COPD. N Engl J Med 2011;365:1184-92. Nishimura M, Makita H, Nagai K, Konno S, Nasuhara Y, Hasegawa M, et al. Hokkaido COPD Cohort Study Investigators. Annual change in pulmonary function and clinical phenotype in chronic obstructive pulmonary disease. Am J Respir Crit Care Med 2012;185:44-52. Johannessen A, Skorge TD, Bottai M, Grydeland TB, Nilsen RM, Coxson H, et al. Mortality by level of emphysema and airway wall thickness. Am J Respir Crit Care Med 2013;187:602-8. Kurashima K, Fukuda C, Nakamoto K, Takaku Y, Hijikata N, Hoshi T, et al. CT-diagnosed emphysema and prognosis of chronic airflow obstruction: A retrospective study. BMJ Open 2013;3:e003541. Ueda K, Jinbo M, Li TS, Yagi T, Suga K, Hamano K. Computed tomography-diagnosed emphysema, not airway obstruction, is associated with the prognostic outcome of early-stage lung cancer. Clin Cancer Res 2006;12:6730-6. Martínez-García MÁ, Soler-Cataluña JJ, Donat Sanz Y, Catalán Serra P, Agramunt Lerma M, Ballestín Vicente J, et al. Factors associated with bronchiectasis in patients with COPD. Chest 2011;140:1130-7. Agusti A, Calverley PM, Celli B, Coxson HO, Edwards LD, Lomas DA, et al. Evaluation of COPD Longitudinally to Identify Predictive Surrogate Endpoints (ECLIPSE) investigators. Characterisation of COPD heterogeneity in the ECLIPSE cohort. Respir Res 2010;11:122. Patel IS, Vlahos I, Wilkinson TM, Lloyd-Owen SJ, Donaldson GC, Wilks M, et al. Bronchiectasis, exacerbation indices, and inflammation in chronic obstructive pulmonary disease. Am J Respir Crit Care Med 2004;170:400-7. O'Brien C, Guest PJ, Hill SL, Stockley RA. Physiological and radiological characterisation of patients diagnosed with chronic obstructive pulmonary disease in primary care. Thorax 2000;55:635-42. Martínez-García MA, de la Rosa Carrillo D, Soler-Cataluña JJ, Donat-Sanz Y, Serra PC, Lerma MA, et al. Prognostic value of bronchiectasis in patients with moderate-to-severe chronic obstructive pulmonary disease. Am J Respir Crit Care Med 2013;187:823-31. Crim C, Calverley PM, Anderson JA, Celli B, Ferguson GT, Jenkins C, et al. Pneumonia risk in COPD patients receiving inhaled corticosteroids alone or in combination: TORCH study results. Eur Respir J 2009;34:641-7.